If anyone else is interested in getting into the beta, but you gotta be a real beta tester, so looking for bugs, floating assets and such. Than contact me here via PM if you are interested. good news, they are opening some servers this weekeend! Do we have any testers (you are probably one of them @"SSgt. Veld") that could compare pre-purchasing RO2 and RS2 because I did the mistake on getting into RO2 too early as soon as it came out and it was so unfinished. In what condition RS2 will be in a month? Do you recommend getting it asap or waiting? Even though the beta had some issues, it was still allot of fun. And at the moment, the game is ready to be pre-purchased already and even is 25% off (deluxe edition even)! So that's just 20 euro's! And 20 euro's for a brand new RO/RS game is a good deal. And with pre-purchasing you get automatically access to the final closed beta weekend before launch. So if you are still not satisfied after that weekend you can still refund it. But it's just 20 euro's right now! More than worth it even if it still will hold bugs at launch! Release date is not known yet, and never look at other sites beside the official website of a game and the steam store page for a release date. Closed Beta Wave 7 starts Thursday, May 11th! TWI is still sending out beta keys to those on the mailing list as well as their business partners will be sharing the keys. But those pre-purchasing the game will have the access to this beta wave as well. can i pre-purchase and get into the Beta today? But just a heads up @"Sgt. Murray", beta will end on Monday already. 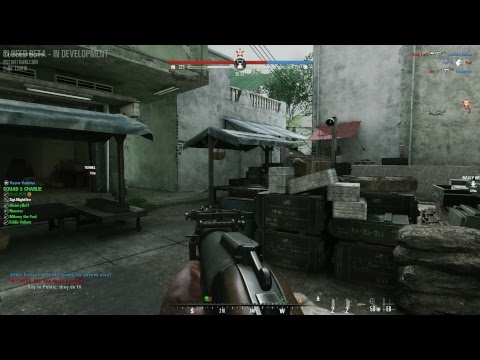 So far there are some improvements but i still noticed old bugs that are still present, like the invisible head bug when someone is on the static mg's, the M-79 sometimes loads smoke or HE even if you did not change the ammo type using the C key. So, I've been looking around, but how many 64 player maps is this game shipping with on launch? So far they got five 64 player maps, than 3 Skirmish maps. Maybe they still got some maps they are working on internally we don't know about. I believe RS also launched with just 5 maps and RS2 with 9. But mappers are already working on maps so custom maps also will become a thing after launch. Pass on the news! RS2 will be going into OPEN BETA this weekend until Monday (so its like a Free Weekend)! And on the 30th of May it will be released! So far from what I've played the games seems to have gone down an even more arcadey venture than Ro2. Not really a big fan of its current state. Some fixes maybe they fixed the voices @"PFC Thomas"
Non-English language support! Players can now enjoy Rising Storm 2: Vietnam in French, German, Spanish, and Portuguese-Brazil. To select a language, right click on the game in your steam library and select a language from the ‘Language’ tab. Rising Storm 2: Vietnam Steam trading cards are now available. Collect the whole set! Stats Wipe for pre-release players - thank you to everyone who participated in the Closed Alpha, Closed Beta and Open Beta waves! Based on the level of progression observed in the Beta, the leveling thresholds have been altered to make leveling in RS2: Vietnam a challenging and rewarding experience. Player stats and achievements have been wiped and all players will begin again at the same level on May 30th. The audio isn't about the sounds or the language. It's the fact that they use Southern dialect for the Northerner-dominated NVA and forced dialect on the Viet Cong. Also doesn't help that a 40-50ish guy moans "I'm just a boy! I'm just a boy" while he bleeds out. And don't get me started on the tattoos. While I think the game in this state is entertaining on it's own, the immersion feels more like Call of Duty Black Ops, which btw has one of the best VNese voice acting in a video game I've ever experienced. 15 minutes and we're off to Vietnam!